Lahore; April 11, 2009: A Khatme Nabuwwat (end of prophethood) conference was held at the central Badshahi Mosque on April 11, 2009 at Lahore. This mosque is directly under the management of the government of the Punjab; its Khatib (the chief cleric) is appointed officially by the Auqaf Department. This historic royal mosque is maintained at a huge expense from the public exchequer. The conference was mostly devoted to anti-Ahmadiyya theme. Extremists’ demands like imposition of Sharia, support to the Swat deal etc were also vigorously made by the speakers. Maulana Hamid Saeed Kazmi, the Federal Minister of Religious Affairs addressed the conference. 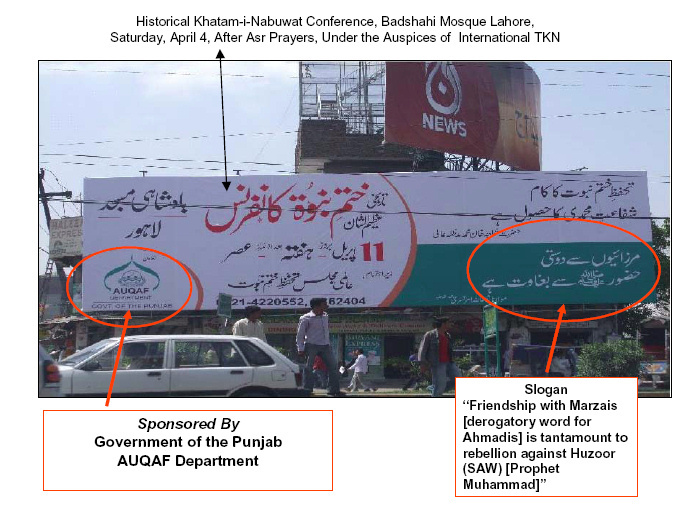 The main banner displayed unabashedly that the conference was the handiwork of Aalami Majlis Tahaffuz Khatme Nabuwwat which is a sectarian anti-Ahmadiyya organization, led primarily by Deobandi and Wahabi ulama. At present Muslims are pitted against the Infidel; all Muslims should unite to fight the Kufr (Disbelief). Israel, India and the U.S. are jointly committed to erase Pakistan from the world map. The government should happily implement the agreements made with the free tribes (of FATA) and should stop the massacre undertaken by American drones in these areas. A criminal case should be registered against all the handlers of the Red Mosque tragedy, including Pervez Musharraf, and they should be dispatched accordingly. Pakistan’s future lies in Nizam Adal (now implemented in Swat). … The U.S. does not support a ‘solution’ to the issue of Khatme Nabuwwat. The Swat agreement should be implemented, and that system should be imposed all over the country. The 1973 Constitution of Pakistan should be restored along with the (Anti-Ahmadiyya) 1974 Amendment regarding End of Prophethood. We shall have to implement the Sharia in Pakistan that will deliver the eradication of Qadianiat. We are ready for total destruction of Qadianis in the country. Qadianism has neither come to an end nor has it been weakened. Qadianis want to finish off all the Muslims all over the world. The massacre resulting from the American drone attacks should be put to stop. The anti-Qadiani law and the Blasphemy law should be vigorously implemented. A criminal case should be registered against all involved in the Lal Masjid tragedy including Pervez Musharraf, and they should be dispatched accordingly. All the ulema should devote at least one Friday sermon every month on the issue of End of Prophethood. Vote of thanks to the Government of the Punjab and its Auqaf Department for their patronage and support. The conference is deeply concerned over the production of bed-sheets with blasphemous or dubious prints by Kamal Spinning Mills Faisalabad and demands the government to direct all the mills to desist from manufacturing such controversial products. Propaganda boards for the conference were also set up by the Auqaf Department. 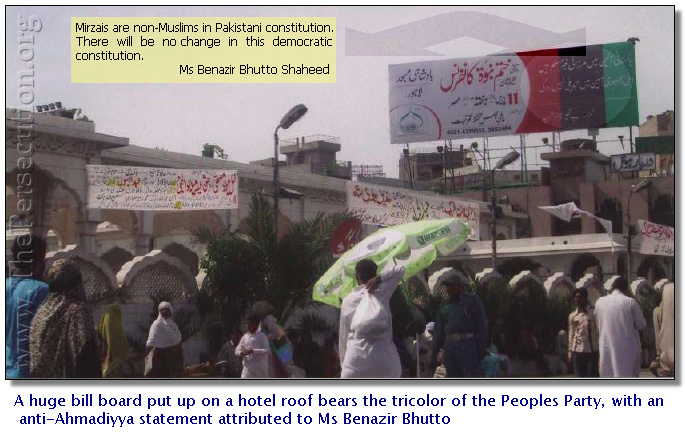 One of these carried the exhortation: “Friendship with Mirzais is tantamount to rebellion against Huzur SAW ( The Holy Prophet Muhammad).” The ruling Peoples Party also put up a huge board with its tricolor and a statement of Ms Benazir Bhutto affirming religious discrimination against Ahmadis. A large number of madrassah students were transported to the conference site. The mullas urged a boycott of all the products form industries owned by Ahmadis, like Shezan drinks etc. However the clerics were treated with Shezan fruit juices by the management, and they consumed them eagerly. A mulla proposed that minarets of all the Ahmadiyya mosques should be demolished, and a ban be imposed on all ‘Qadiani’ activities in Rabwah. Approximately 200 policemen were employed to provide security cover to the conference. A mulla demanded that Ahmadis should be removed from all key posts; also they should be eliminated from defense services. 150 stalls were set up there. Provocative slogan and stickers were pasted on them. A derogatory sketch of the holy founder of the Ahmadiyya community was displayed in the background of the central stage. The Badshahi Mosque was profusely illuminated for the occasion at public expense. A great deal of publicity was given to the conference in other cities and people were urged to travel to Lahore and participate in it. Special articles on anti-Ahmadiyya theme were written and published in the Urdu press for the occasion. PML (Nawaz) is at the helm in the Punjab. It was announced from the stage that the next such conference would be held at Islamabad. In short, the speakers at this conference, held in the name of a religious belief, urged violation of human rights, spoke against freedom of religion, promoted sectarian strife, indulged in controversial national and international politics and propagated hatred and violence. “I do not think a lot of people understand the gravity of the issue”, said a senior police official in Punjab. “If you want to destabilize Pakistan, you have to destabilize Punjab”. The Government of the Punjab appears to be making the same mistake that it made in 1953, and came to great harm at the hand of the mulla. ‘Report of THE COURT OF INQUIRY constituted under Punjab Act II of 1954 to enquire into the PUNJAB DISTURBANCES OF 1953’ refers.